High Engagement Style: Easy-to-read, interactive, writing style that engages students through active learning techniques. Personalized Marketing: A vivid and accurate description of businesses, marketing professionals, and entrepreneurs—through cases, exercises, and testimonials—that allows students to personalize marketing and identify possible career interests. 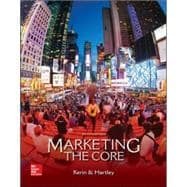 Marketing Decision Making: The use of extended examples, cases, and videos involving people making marketing decisions. Integrated Technology: The use of powerful technical resources and learning solutions, such as Connect, LearnSmart, SmartBook, www.kerinmarketing.com, and video links. Traditional and Contemporary Coverage: Comprehensive and integrated coverage of traditional and contemporary concepts. Rigorous Framework: A pedagogy based on the use of learning objectives, learning reviews, learning objectives reviews, and supportive student supplements.